Yes, until recently, I had never played Settlers of Catan . I’ve been to dozens of game nights where other people were playing. It looked too complicated at first, and then too boring, so I avoided it. Then it became a “thing.” Never having played it was such a rare thing among my friends that I held on to the distinction. But times change, and my curiosity got the better of me. I wanted to try playing Settlers of Catan . 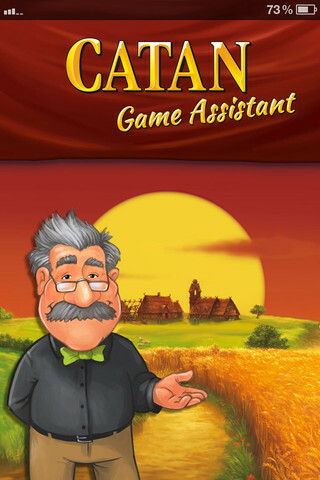 My timing was good because a new app came out recently called Catan Game Assistant . It was designed for people like me, people who had never played the game. I knew it all had something to do with trading sheep for wood, but the rest of it was unknown to me. Even after watching Wil Wheaton and friends play it on TableTop , I still didn’t feel like I knew what the game was about. I suspected it was the kind of game that needed to be played numerous times to get a feel for the strategy, and figure out what works best for you. My kids were excited to play with me, since they’d both played the game a few times with their dad, and for once, they knew more about a game than I did. So the three of us dove in together. As any geek knows, part of the fun of getting a new game is opening it for the first time, punching out the pieces, and getting it organized. My son called dibs on opening the shrink wrap, but we all punched out the pieces. Just seeing the pieces proved to me that I only knew a fraction of what this game was about. The wood pieces I understood. But all the little tokens were new to me. I didn’t remember seeing them on TableTop . But I did love that the game comes with little baggies to hold all the different pieces. This was well thought out. Once we got the game organized, we started the Catan Game Assistant app, available free for iOS and Android. While I love games, and often love complicated games, games where you have to sit alone with the rules for an hour to sort of understand it, then play once or twice before you get the hang of it, constantly consulting the rules, can get really frustrating. Especially with children. I was excited to have a tutorial to step me through it. Catan Game Assistant consists of a Tutorial, Dice, an FAQ, and some other information. The tutorial can be set up for three players, four players, or a variable game setup. We chose the three player option. The tutorial seems to be for people who don’t want to read the game rules at all. There is a slightly snarky narrator who tells you exactly what to do, and you can also read what he’s saying at the bottom of the screen. The tutorial started on page 1 of 95, so I knew it would be thorough. You even start with setting up the game. We’d already set it up, correctly fortunately. My kids seemed to know what they were doing there. But I liked how the tutorial literally assumes you know nothing about the game. This is what I needed. You can also skip more quickly through the setup pages if you just want the game directions. Using the tutorial instead of reading through the directions cold is a bit like having that friend–you know you all have at least one–who is excellent at teaching groups to play new games. The tutorial is specific even to the point of saying what color everyone has to be. But since there were only three of us, we got an imaginary fourth player, Tom, who played with us. Hi, Tom! There is no decision-making to be done playing through the tutorial, just absorbing the rules. It tells you exactly what to roll, where to place pieces, and what cards to draw and trade. My kids were hoping to play a regular game, but there would be plenty of time for that after the tutorial, when I know what I’m doing and have a fighting chance of beating them! Soon Fleur, the tutorial guy’s “charming” assistant, joins us in the game. She goes over what goes on during a turn. You then play several rounds of turns, and are eventually set free, leaving Tom’s pieces on the board, to finish up the game on your own. The app directs you to the FAQ if you have any questions. The app also has dice rolling functionality built in, along with dice rolling statistics, from 2 to 12, for those statisticians out there. So, what did I think of the game? It didn’t surprise me in any significant way, but I’m really glad to know how to play now. It was a lot of fun, and another great strategy game to play with my friends and family. Now I can at least attempt to hold my own playing with friends, and I’m enjoying developing a strategy. One friend in particular, however, formed an effective strategy much faster than I did, so winning may be out of the question. But it’s not all about winning, is it? 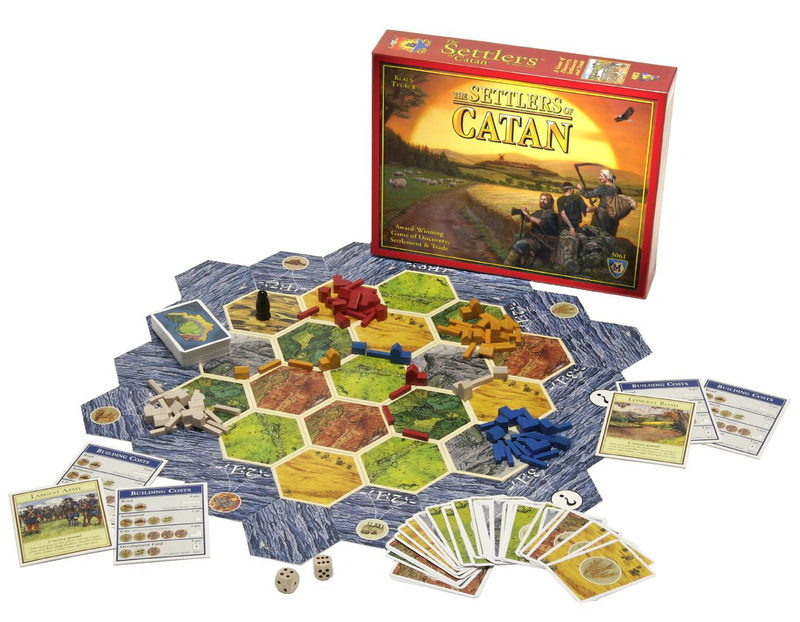 Settlers of Catan retails for $42, but is cheaper on Amazon. It is one of the staple games that occupies the shelves of geeks everywhere. Now I can say it has a place on mine, too. Catan Game Assistant is a free app for iOS and Android and a perfect accompaniment to those new to Settlers of Catan . Note: I received a copy of the game and the app for review purposes.